Families and New Fences: The Perfect Pair! For homeowners in Richmond looking to start a family, there are countless things to plan for- and then there are the things for which you simply can’t prepare ahead of time! While life will always throw curveballs your way, you don’t have to let a threat to your basic safety be one of them. For your family, a fence can provide you with the security and peace of mind you need! Read on to find out more. 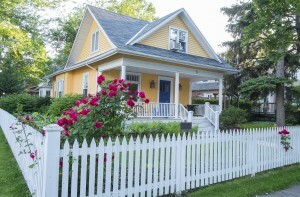 Fences are the ideal addition to any home, but particularly one that houses a family. If you have young children who spend lots of their time playing outside in your yard, a fence is the perfect way to keep them safe. This way, they will not wander off your property line, their toys and bikes will stay out of the road, and you will easily be able to keep an eye on your children from the comfort of your home. The same goes for the family pet- dogs and kids alike will be given a safe place to play together when you add a new fence to your home! This entry was posted on Friday, September 19th, 2014 at 7:26 pm. Both comments and pings are currently closed.